John Christian Watson (born John Christian Tanck; 9 April 1867 – 18 November 1941), commonly known as Chris Watson, was an Australian politician who served as the third Prime Minister of Australia. He was the first Prime Minister from the Australian Labour Party, and led the world's first Labour Party government, indeed the world's first socialist or social democratic government, at a national level. From paternal German and maternal British ancestry, he is the only Australian Prime Minister not born in a Commonwealth country. First elected to the Parliament of New South Wales seat of Young from the 1894 colonial election, Watson moved to the Parliament of Australia seat of Bland at the inaugural 1901 federal election following the Federation of Australia, where the state Labour parties received a combined 15.8% of the first past the post primary vote against the two more dominant parties. The Caucus chose Watson as the inaugural parliamentary Labour leader on 8 May 1901, just in time for the first sitting of parliament. Labour led by Watson increased their vote to 31% at the 1903 federal election and 36.6% at the 1906 federal election, the latter of which saw Watson move from his abolished seat of Bland to South Sydney. Labour held the balance of power since 1901 and usually provided confidence and supply to the Protectionist Party governments of Edmund Barton and Alfred Deakin and frequently supported their legislation in exchange for Labour policy implementation. Watson's term as Prime Minister was brief – only four months, between 27 April and 18 August 1904. The Watson Government did pass a handful of bills, but more importantly it set the precedent of a Labour Party Prime Minister. He resigned as Labour leader in 1907 and from Parliament in 1910. Labour led by Andrew Fisher would go on to win the 1910 federal election with over 50% of the primary vote, representing a number of firsts: it was Australia's first elected federal majority government; Australia's first elected Senate majority; the world's first Labour Party majority government at a national level; and after the 1904 Watson minority government, the world's second Labour Party government at a national level. According to Percival Serle, Watson "left a much greater impression on his time than this would suggest. He came at the right moment for his party, and nothing could have done it more good than the sincerity, courtesy and moderation which he always showed as a leader". Alfred Deakin wrote of Watson: "The Labour section has much cause for gratitude to Mr Watson, the leader whose tact and judgement have enabled it to achieve many of its Parliamentary successes". John Christian Watson had claimed that his father was British-born miner George Thomas Watson. However, historical records have since indicated that his biological father was Johan Cristian Tanck, a Chilean national of German descent. His British-born mother, Martha, married Tanck on 19 January 1866, who as chief officer of the ship Julia had arrived in New Zealand a month earlier. On 2 February 1866, the couple commenced departure to South America, with Martha giving birth on 9 April 1867 in Valparaíso, Chile. The couple separated in 1868 however and Martha returned to New Zealand with her son, where she re-married to British-born George Thomas Watson on 15 February 1869, and made her 22-month-old son part of her new family. The Constitution of Australia required all federation parliamentarians to be "subjects of the Queen", defined at the time as the subject's biological father having been born, or born themselves, in a Commonwealth country − upon becoming Prime Minister of Australia he wrote that "when a child, he removed with his British parents from South America to New Zealand", which if correct would have duly classified him as a subject of the Queen. His actual paternal genealogy was not publicly known during his life and it is not known whether he was aware of it. A biography later claimed that his mother "went to considerable lengths to invent a British pedigree". In a 1993 interview, his daughter Jacqueline Dunn née Watson claimed he was born at sea in international waters off Chile. Watson attended the state school in Oamaru, North Otago, New Zealand until ten years of age when he left to become a rail nipper. Then after a period of helping on the family farm, at thirteen years of age he was apprenticed as a compositor at The North Otago Times, a newspaper run by prominent reformist politician William Steward, with the public affairs exposure augmenting his minor formal schooling. Following the death of his mother and the loss of his job, he migrated to Sydney in 1886 at nineteen years of age. He worked for a month as a stablehand at Government House, then found employment as a compositor for a number of newspapers including The Daily Telegraph, The Sydney Morning Herald and The Australian Star. Through this proximity to newspapers, books and writers he furthered his education and developed an interest in politics and became active in the printing union. He married Ada Jane Low, a British-born Sydney seamstress, at the Unitarian Church on Liverpool Street in Sydney on 27 November 1889. Stemming from the nascent Australian labour movement, Watson was a founding member of the originally named Labour Electoral League of New South Wales in the months prior to the 1891 colonial election at which Labour would win the balance of power and provide confidence and supply to the Protectionist Party minority government led by Premier George Dibbs which brought down the incumbent majority government of the Free Trade Party led by Premier Henry Parkes. Watson was an active trade unionist, and became Vice-President of the Sydney Trades and Labour Council in January 1892. In June 1892, he settled a dispute between the Trades and Labour Council and the Labour Party and as a result became the president of the council and chairman of the party. In 1893 and 1894, he worked hard to resolve the debate over the solidarity pledge and established the Labour Party's basic practices, including the sovereignty of the party conference, caucus solidarity, the pledge required of parliamentarians and the powerful role of the extra-parliamentary executive. At the 1894 colonial election where the Protectionist Party government was defeated, Watson was elected to the New South Wales Legislative Assembly for the country seat of Young. The incumbent Free Trade Party minority government led by Premier George Reid increased their support at the 1895 colonial election but remained several seats short of a majority. Labour at this time had a policy of "support in return for concessions", and Watson voted with his colleagues to strategically provide such legislative support to the incumbent government. Following the 1898 colonial election, despite a significant swing against the incumbent government, Watson and Labour leader James McGowen decided to allow the incumbent government to remain so that it could complete the work of establishing the Federation of Australia. Watson assisted to shape party policy regarding the movement for federation from 1895, and was one of ten Labour candidates nominated for the Australasian Federal Convention on 4 March 1897, however none were elected. The party, perforce, endorsed federation, however they took a view of the draft Commonwealth constitution as undemocratic, believing the Senate as proposed was much too powerful, similar to the anti-reformist Colonial state upper houses, and the UK House of Lords. When the draft was submitted to a referendum on 3 June 1898, Labour opposed it, with Watson prominent in the campaign, and saw the referendum rejected. Watson was devoted to the idea of a referendum as an ideal feature of democracy. To ensure that Reid might finally bring New South Wales into national union on an amended draft constitution, Watson helped to negotiate a deal, involving the party executive, that included the nomination of four Labour men to the New South Wales Legislative Council. At the March 1899 annual party conference, Billy Hughes and Holman moved to have those arrangements nullified and party policy on Federation changed, thus thwarting Reid's plans. Watson, for once, got angry; he 'jumped to his feet in a most excited manner and in heated tones … contended … that they should not interfere with the referendum'. The motion was lost. The four party men were nominated to the council on 4 April and the bill approving the second referendum, to be held on 20 June, was passed on 20 April. Labour, including Watson, opposed the final terms of the Commonwealth Constitution, however their voting status was not enough to stop it from proceeding, and unlike Holman and Hughes, he believed that it should be submitted to the people. Nevertheless, with all but two of the Labour parliamentarians, he campaigned against the 'Yes' vote at the referendum. When the Constitution was accepted, he agreed that 'the mandate of the majority will have to be obeyed'. He had made an essential contribution to that democratic decision. Group photograph of all Federal Labour Party MPs elected at the inaugural 1901 federal election, including Watson, Andrew Fisher, Billy Hughes, and Frank Tudor. Watson in the House of Representatives in 1902. Watson was elected to the new federal Parliament at the inaugural 1901 federal election, in the House of Representatives rural seat of Bland. Arriving in May in the temporary seat of government, Melbourne, Watson was elected the first leader of the Federal Parliamentary Labour Party (usually known as the Caucus) on 8 May 1901, the day before the opening of the parliament. In the federal Parliament, where Labour was the smallest of the three parties, but held the balance of power, Watson pursued the same policy as Labour had done in the colonial parliaments. Watson Labour provided confidence and supply to the Protectionist Party minority governments of Edmund Barton and Alfred Deakin in exchange for legislation enacting the Labour platform, such as the immensely popular White Australia policy which left the free Trade Party led by George Reid to form the opposition. Watson, as a Labour moderate, genuinely admired Deakin and shared his liberal views on many subjects. Deakin reciprocated this sentiment. He wrote in one of his anonymous articles in a London newspaper: "The Labour section has much cause for gratitude to Mr Watson, the leader whose tact and judgement have enabled it to achieve many of its Parliamentary successes." Portrait of John Christian Watson. Labour under Watson doubled their vote at the 1903 federal election and continued to hold the balance of power despite all three parties holding about the same number of seats. In April 1904, however, Watson and Deakin fell out over the issue of extending the scope of industrial relations laws concerning the Conciliation and Arbitration Bill to cover state public servants, the fallout causing Deakin to resign. Reid declined to take office, which saw Watson become the first Labour Prime Minister of Australia, the world's first Labour head of government at a national level (Anderson Dawson had led a short-lived Labour government in Queensland in December 1899), indeed the world's first socialist or social democratic government at a national level. He was aged only 37, and remains the youngest Prime Minister in Australia's history. Mr Watson, the new Prime Minister entered the room, and seated himself at the head of the table. All eyes were riveted on him; he was worth going miles to see. He had dressed for the part; his Vandyke beard was exquisitely groomed, his abundant brown hair smoothly brushed. His morning coat and vest, set off by dark striped trousers, beautifully creased and shyly revealing the kind of socks that young men dream about; and shoes to match. He was the perfect picture of the statesman, the leader. Despite the apparent fitness of the new Prime Minister for his role, the government hung on the fine thread of Deakin's promise of 'fair play'. The triumph of the historic first Australian Labour government was a qualified one – Labour did not have the numbers to implement key policies. The 'three elevens' – the lack of a definite majority in the parliament after the second federal election – dogged Watson just as it had Deakin. Six bills were enacted during Watson's brief government. All but one – an amended Acts Interpretation Act 1904 – were supply bills. The most significant legislative achievement of the Watson government was the advancement of the troublesome Conciliation and Arbitration Bill. Another accomplishment was the appointing of a Royal Commission on a Bill related to Navigation and Shipping, whose report (presented a couple of years later) led to “major redrafting of the Navigation Act” and improvements in conditions for Australian seamen. Once he became the Prime Minister Watson recognized the limitations of his position in the Labour caucus and endorsed the concept of a deputy leader. Andrew Fisher won the position by one vote over the more dynamic Billy Hughes. Although Watson sought a dissolution of parliament so that an election could be held, the Governor-General Lord Northcote refused. Unable to command a majority in the House of Representatives, Watson resigned the premiership less than four months after taking office, his term ending on 18 August 1904 (Deakin was later defeated on a similar bill). Reid became Prime Minister and four months later his government managed to pass the Conciliation and Arbitration Bill after compromising to extend the scope to state public servants as Watson had proposed. Deakin again became Prime Minister after Reid lost confidence of the parliament in July 1905. Watson led Labour to the 1906 federal election and improved their position again. At this election the seat of Bland was abolished, so he shifted to the seat of South Sydney. But in October 1907, mainly due to concern over the health of his wife Ada, he resigned the Labour leadership in favour of Andrew Fisher. Watson retired from politics, aged only 42, prior to the 1910 federal election, at which Labour won with 50 percent of the primary vote. It was the first time a party had been elected to majority government in the House of Representatives, it was also the first time a party won a Senate majority, and it was the world's first Labour Party majority government at a national level. The ALP vote had risen rapidly, going from 15 percent against two larger and more established parties in 1901, to 50 percent in 1910, after a majority of the Protectionist Party merged with the Anti-Socialist Party, creating the Commonwealth Liberal Party which received 45 percent. Out of the Parliamentary arena, Watson continued to work for Labor, becoming Director of Labor Papers Ltd, publishers of The Worker, the Australian Workers' Union paper. He also pursued a business career and was also a parliamentary lobbyist. Resulting from the Australian Labor Party split of 1916, some MPs were expelled from the party for supporting World War I conscription in Australia. Watson sided with ex-Labor Prime Minister Billy Hughes and the conscriptionists and had his party membership terminated as a result. Watson remained active in the affairs of Hughes' Nationalist Party until 1922, but after that he drifted out of politics altogether. Watson devoted the rest of his life to business. He helped found the National Roads and Motorists Association (NRMA) and remained its chairman until his death. He was also a founder of the Australian Motorists Petrol Co Ltd (Ampol). His wife Ada died in 1921. On 30 October 1925 Watson married Antonia Mary Gladys Dowlan in the same church as his first wedding. She was a 23-year-old waitress from Western Australia whom he had met when she served his table at a Sydney club. In 1927, they had one daughter, Jacqueline Dunn née Watson. 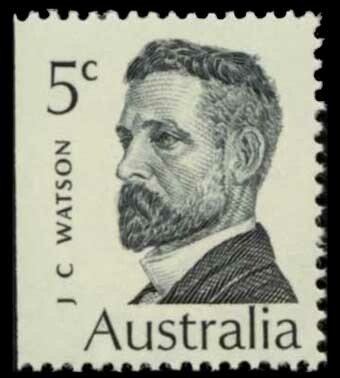 Watson died on 18 November 1941 at his home in the Sydney suburb of Double Bay. In April 2004 the Labor Party marked the centenary of the Watson Government with a series of public events in Canberra and Melbourne, attended by then party leader Mark Latham and former ALP Prime Ministers Gough Whitlam, Bob Hawke and Paul Keating. The Canberra suburb Watson and the federal electorate of Watson are named after him. In 1969 he was honoured on a postage stamp bearing his portrait issued by Australia Post. ^ a b c "A perfect picture of the statesman: John Christian Watson - Museum of Australian Democracy". Moadoph.gov.au. Retrieved 30 June 2018. ^ a b c d e f g h i j k l m n o p q r s Nairn, Bede (1990). "Watson, John Christian (1867–1941)". Australian Dictionary of Biography. Canberra: Australian National University. Retrieved 9 February 2010. ^ Serle, Percival (1949). "Watson, John Christian". Dictionary of Australian Biography. Sydney: Angus and Robertson. Retrieved 9 April 2010. ^ a b "Chris Watson: Australia's second Treasurer - Australian Treasury". Archive.treasury.gov.au. Retrieved 30 June 2018. ^ "Watson, John Christian (Chris)". Biographical entry. Australian Trade Union Archives. Retrieved 9 February 2010. ^ "Guide to the Papers of John Christian Watson – MS 451". National Library of Australia. Retrieved 9 February 2010. ^ a b "Chris Watson, Early years". Australia's Prime Ministers. National Archives of Australia. Retrieved 9 February 2010. ^ a b Norman Abjorensen (21 August 2017). "Former prime minister Chris Watson and King O'Malley almost certainly fell foul of Section 44". Sydney Morning Herald. Retrieved 30 June 2018. ^ a b Norman Abjorensen (2 November 1993). "Watson a British subject". Canberra Times. Retrieved 30 June 2018. ^ "Chris Watson, Ada Watson". Australia's Prime Ministers. National Archives of Australia. Retrieved 9 February 2010. ^ "Mr (Chris) John Christian Watson (1867–1941)". Members of Parliament. Parliament of New South Wales. Archived from the original on 24 March 2011. Retrieved 9 February 2010. ^ "Chris Watson, Elections". Australia's Prime Ministers. National Archives of Australia. Retrieved 9 February 2010. ^ a b "Chris Watson, Federal Labour leader 1901". Australia's Prime Ministers. National Archives of Australia. Retrieved 9 February 2010. ^ a b "Chris Watson, The first national Labour government". Australia's Prime Ministers. National Archives of Australia. Retrieved 10 February 2010. ^ Brian Carroll. "Australia's Prime Ministers: From Barton to Howard". Google Books. Retrieved 30 June 2018. ^ "Achievements". Pandora Archive. 5 June 2018. Retrieved 30 June 2018. ^ "Chris Watson, In office". Australia's Prime Ministers. National Archives of Australia. Retrieved 10 February 2010. ^ "Chris Watson, The fall of the Watson government". Australia's Prime Ministers. National Archives of Australia. Retrieved 10 February 2010. ^ a b "Chris Watson, After office". Australia's Prime Ministers. National Archives of Australia. Retrieved 10 February 2010. ^ "Fast facts - Chris Watson". Australia's Prime Ministers: National Archives of Australia. Retrieved 30 June 2018. ^ "Stamp". Australian Stamp and Coin Company. Retrieved 9 February 2010. Wikimedia Commons has media related to Chris Watson. The last page of a secret despatch from Australia's Governor-General to Britain's Colonial Secretary 23 April 1904, detailing circumstances that created the first Labor Prime Minister in the British Empire (and the world). This page was last edited on 3 September 2018, at 21:26 (UTC).